A man has been arrested by police investigating the death of a driver hit by a lorry on the M25. A man has been hit and killed by a lorry on the M25 after getting out of his car on the hard shoulder to check for damage. Early morning commuters in Surrey were faced with an unusual obstruction on their way to work - a crashed boat. People are being advised to avoid a section of the M25 this weekend due to an emergency services exercise. It will be closed to all traffic in both directions between junction 25 (A10/Enfield) and junction 27 (M11) between 10pm tonight and 6am tomorrow. Both carriageways will be closed in order to carry out routine testing on systems and equipment in the Bell Common Tunnel near Epping and the Holmesdale Tunnel near Enfield, led by Highways England. Using the existing road closure, a critical incident exercise will be conducted by the emergency services. This exercise is designed to test emergency services response to a serious collision that blocks the M25 and involves emergency services from London, Essex and Hertfordshire. One lane closed and heavy traffic due to broken down car and recovery work on M25 clockwise. The delays are between J5 M26 / A21 and J6 A22 / B2235 (Godstone). A Sudanese man believed to have travelled to the UK from Calais by clinging to the bottom of a lorry has died after falling between its wheels on the M25. Two men from the Sudan are believed to have climbed underneath a foreign HGV in the French port at around 11am yesterday and wedged themselves into position, Scotland Yard said. The pair are believed to have travelled on the bottom of the vehicle on the Eurostar and arrived in England about 40 minutes later. After the first man managed to get free of the vehicle as it stopped between junctions 24 and 25 of the motorway, police said the second man attempted to do the same but was badly injured as the lorry began to move off. A member of the public stopped his vehicle and pulled the injured man to the edge of the carriageway, before driving off. A second member of the public stopped his vehicle and offered assistance. London's Air Ambulance attended but the man was pronounced dead at the scene. Two men have been arrested on suspicion of causing death by dangerous driving following a pile-up on the M25 motorway. Four lorries and a Peugeot car were involved in the collision. The arrested men, aged 33 and 25, are both in hospital and will be interviewed in due course, according to Essex Police. The vehicles involved were a Peugeot car, a Scania lorry, a DAF artic, a Mercedes lorry and a Romanian lorry. The man who died was pronounced dead at the scene and his body has now been taken to the mortuary at Princess Alexandra Hospital in Harlow. He is believed to be a 39-year-old man from Leicester. Four other people remain in hospital receiving treatment for injuries which are not believed to be serious. 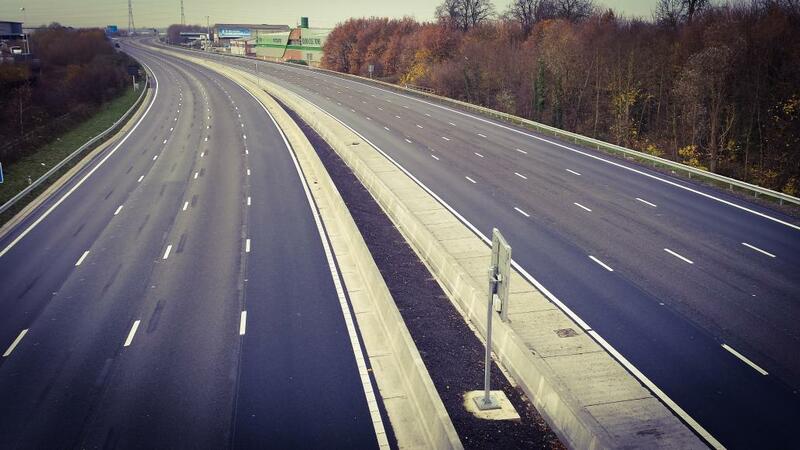 The M25 currently remains shut between junctions 25 and 27 while clean up and repair work continue. Police have now released the scene to the Highways Agency. The crash is understood to have involved a lorry crossing the central reservation. At this time we have one confirmed fatality and a number of people who are trapped in their vehicles. There is debris across both sides of the M25 and the motorway will be closed for the foreseeable future while we deal with this collision and begin our investigations to establish what has happened. If it is at all possible motorists are advised to avoid the area and find alternative routes. Nothing will be moving around this portion of the M25 for some considerable time, and the morning rush-hour is likely to be affected.